Our U 19 program capped off an undefeated season with National Championship win. 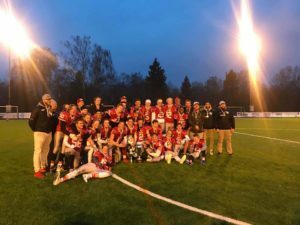 With the U 19 season coming to an end, our U 19 Vikings came from behind on two different occasions to cap off their undefeated season with a 25-14 win over the Vålerenga Trolls. The Trolls had been 5 time defending champions. It was a hard fought game on both ends as it normally is when these two clubs meet. The Vikings started the game in unfamiliar territory. Vålerenga took a 7-0 lead, this was the first time the Vikings had been trailing in the scoreboard all season long. After that score by the Trolls the lead did not last long. One play after the kickoff, the Vikings answered with a 70 yard run from running back Aleksander Thomas. That brought the score to 7-7 going into halftime. In the Second half, the Trolls went on to take a 14-7 lead in the third quarter. Once again, that lead did not last long either. The Vikings replied with a 10 yard touchdown pass from quarterback Wilhelm Domaas to slot receiver Per Gaarden. The Vikings however missed the extra point to bring the score to 14-13. While still trailing by one point the Vikings went back to the air attack. This time it was the connection of quarterback Wilhelm Domaas to wide receiver Frans Åsheim. This was Åsheim`s 7th touchdown of the season and it could not have come at a bigger time. The Vikings went on to a 19-14 lead after a high snap on the PAT attempt. In the closing minutes the Vikings marched down the field to finish the drive on a 10 yard touchdown run from running back Aleksander Thomas. Making it 25-14 for our Vikings. 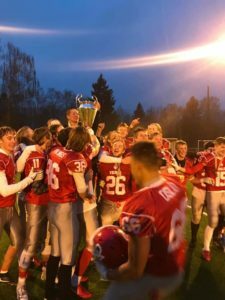 With the win the Vikings finished the season with a 7-0 record and bragging rights for all of Norway. 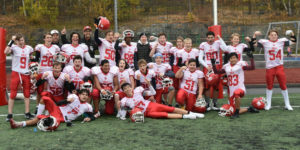 We would like to congratulate our young Vikings for winning our 3rd title of the 2018 season. They will be joining our U 15 and Senior Elite teams in the winners circle.